Labours of Love Exhibition, 2015. Image provided by Hazelhurst Gallery. It's always an incredible experience to be a part of an exhibition. Labours of Love was beautifully curated and presented by Louise Mitchell and her team at Hazelhurst Gallery. I felt incredibly fortunate to have my work shown amongst an esteemed collection of historic and contemporary quilts. Each tells a story of intimate personal histories alongside cultural and social insights. Textiles are so good at this! Attending the opening night with family, colleagues and friends was the perfect way to celebrate five months of dying, stitching and felting. So often such endeavours pass without public acknowledgement. If felt slightly strange seeing my quilt outside of my home and in front of a crowded gallery. There was a strict no photography policy to protect the historic quilts. Embarrassingly the flowers my sister had given me dripped water in the carefully calibrated environment. A credit to the gallery that they were quicker than a SWAT team to come control the 'leak'! I was hoping to return to see the exhibition without the crowds of people from the opening. However my last month of pregnancy kept me at home. Fortunately the exhibition catalogue documented each quilt so that I could go through and find the ones that resonated most with me. The catalogue is now sold out, but you can download the PDF for free from the Hazelhurst Gallery website. Top Row: Months of stitching work from before the disaster. Bottom Row Left: Traces of the stitch work after the disaster. 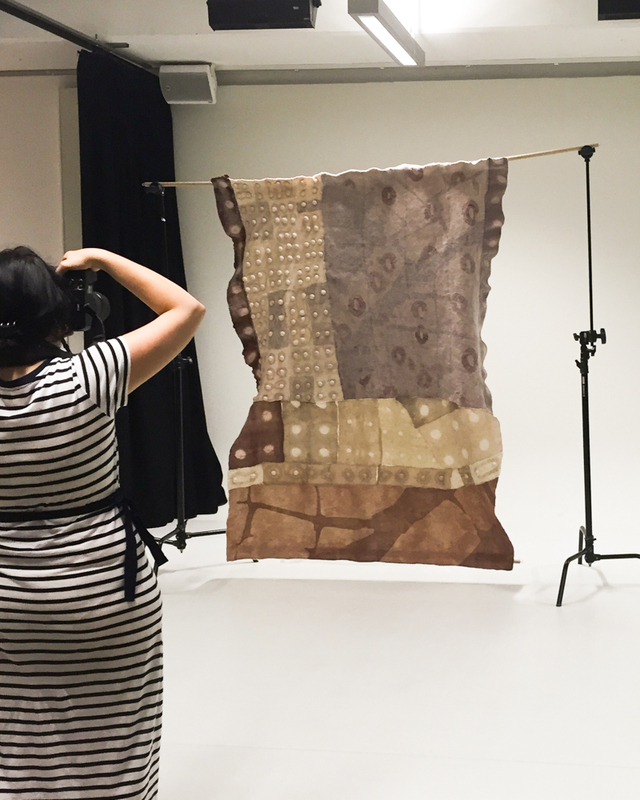 Bottom Row Right: My sister and talented photographer, Hannah Morgan, capturing the finished quilt for the exhibition catalogue. Two days before the catalogue photoshoot, disaster struck. The quilt shrunk. To half it’s size. Felting is all about ‘shrinking’. As the rubbing and rolling (fulling) process tangles the wool fibres together and they form a dense fabric. The more rubbing and rolling (along with warm water and soap), the denser the fabric and the more shrinkage there is. I’m sure everyone has had a warm-wash accident with a wooly jumper in the past. Wool is now often treated with chemicals to avoid shrinkage and is known as “superwash wool”. This is wool that is made by exposing the fibre to a chlorine gas that erodes the scales and then it is coated in a plastic called Hercosett 125. An article by Ashley from Woolful explains more about super wash and why we should think twice about having it near our skin. For felters, superwash fleece and yarn is best avoided as it is near impossible to felt. The quilt hadn’t decreased in size as much as I’d hoped using just hand-felting techniques. And I thought it would be better if it was a little denser and heavier too. So I put it into the washing machine on very low heat. After three cycles, gradually raising the temperature, I wasn’t getting the results I wanted. So I cranked the heat up on the fourth cycle and happily went about some other chores. The washing machine beeped to tell me the quilt was ready to come out. As I was extracting it I felt that it was very dense… a good thing! Then I started hanging it out and suddenly realised that the whole thing was much smaller than before. Much smaller. In addition, five months of stitching was virtually erased. Ugh. It was not the time to panic. With two days to fix this, I had a chat to a friend, and decided that an additional piece could be made and attached to the quilt. Fortunately I had already started work on a second piece for the Wangaratta Contemporary Textile Award. On reflection and a little bit of distance from the disaster, and a few chats with my friends and family, I’ve come to realise that the shrinking episode in the end enhanced the concept of fading memory. Only I know how much work is buried within the compressed fleece. Traces of past stitch lines are glimpsed under the surface. The additional panel shows the original qualities of the work, revealing a passage of time and it’s impact upon recollection. The choice to dye my silk remnants used in Topology of Memory is driven by numerous reasons. I wrote an article for The Plant Hunter if you'd like to read more of the story of the Moreton Bay Fig Tree & dyeing with the fruit. I’m interested in the instability of natural dyes as I think it provides a potent metaphor for the fading of memories. I expect, over time, that the colours will etiolate from the quilt. And I’m okay with that. Embracing this change as a positive is in direct opposition to the priorities of commercial textiles. Any change in colour is seen as an imperfection and a sign to throw the fabric away. Some of the silks were dyed with memory-charged herbs, such as Rosemary, Bacopa Monnifera, Gotu Kola and Gingko Bilboa. Not all were successful, but I enjoyed experimenting with each one. I also applied a process of folding, tying and blocking my silk remnants before the dye bath to create un-dyed shapes on the cloth. This gives a sense of the resistance of memory to retain accurate detail from a past experience. The memory of place, and the potential inaccuracy of this memory, reminds me of a term coined by Duncan Bell (2003) - Mythscape. Bell uses this to describe the ‘temporally and spatially extended discursive realm in which myths of the nation are forged, transmitted, negotiated, and reconstructed constantly.’ I feel I do the same with my memory of emotionally charged places of my childhood - my recollections have become myths over time. Gathering natural dye sources from my local haunts has ingrained time and place into the quilt. Topology of Memory traverses a childhood past and mixes them with the present. The act of gathering fruit from under Moreton Bay Fig trees recreates the long days adventuring on the family farm, collecting treasures, unaware of time passing, observing the small and the large details of the land. I was pregnant with our first baby while foraging for the figs, so the memory of bending and stooping by the foreshore of Blackwattle Bay with a big belly is strong. It was a physical touching of the land that connected me and the dyed cloth to place. sometimes it’s just about the colour. Finding the red-dirt hues of the land was important to me and was eventually achieved with a mixture of cutch and logwood. Both were sourced from suppliers rather than my surrounding environment. The different levels of reds were discovered by using a variety of silks, and removing them from the dye pot at different times. The longer they soaked, the stronger their colours. The longer one ponders a memory, does it strengthen in the same way? And it’s always about avoiding toxins. The effect chemical dyes have on the environment and the human body are numerous. The textile industry has much to answer for in terms of environmental damage in the pursuit long-lasting and commercially stable dyes. Natural dyes still need to be handled with care (and never thrown onto the backyard grass like I once did with dire results) and safety equipment is a priority in terms of skin, respiratory and eye protection. However they offer a much safer and more responsible process of embedding colour into cloth. Although Topologies of Memory does not follow the conventional ways of quilting, there are elements of this tradition that have inspired the work. Australia's quilting traditions are uniquely defined by our cultural, social and climactic differences to Britain and the United States. The art-form has been influenced by international trends, but it has also developed idiosyncratic characteristics that represent our country. Indigenous Australians made beautiful patchwork rugs and cloaks from kangaroo pelts and possum skins. The cloaks were sometimes engraved with traditional symbols rich with meaning, but only six examples from the nineteenth century survive. Recently a group of four aboriginal women began a project to revive this tradition of cloak making - you can read more about it here. Rug, kangaroo skin / fur / felt, maker unknown, Hermannsburg, Northern Territory, Australia, c. 1965. "This rug is of great significance because of the rarity of it and also it's historical importance of combining traditional Indigenous stitching techniques with modern European patchwork influences in the design. " "It represents the work that was being produced at Hermannsburg during the 1960s. The label attached to the back of the rug "Product of Hermannsburg Mission Central Australia" also contributes to its rare significance as there are only two of these rugs known in existence.This rug was produced by several unknown women from the Hermannsburg Mission tannery, Northern Territory in about 1965." Quilting was used as occupational therapy and as a means of income for female convicts making the long trip to NSW. Women were given sewing equipment to make quilts while at sea to sell on arrival, where familiar symbols of a distant home increased their demand. The making of quilts on the long voyages also gave the women something to occupy their time, given the incredibly long and difficult sea journey. The Rajah quilt 1841, This quilt is an important example of the work British women did on board the Rajah en-route to Hobart. Collection of the National Gallery of Australia. Gift of Les Hollings and the Australian Textiles Fund 1989. Quilts in northern and middle regions of Australian were often made without the inner wadding due to the warmer climate. In colder regions, when the price of wool rose, men and women adopted innovative ways to create utilitarian quilts by repurposing the fabric available to them. The most well known of these are known as Waggas, named after the fine quality flour sacks from Wagga Wagga, NSW. These sacks were used as wadding between two fabrics, and sometimes as the covers themselves. The term began to be used for any covering made from repurposed fabrics, such as men's suiting swatches, sugar bags, blanket samples, un-repairable clothes and hessian sacks. The Wagga has come to symbolise utilitarian functionality, inventive repurposing of materials during times of hardship, and living on and with the land. "Wagga quilt, machine-pieced from old woollen suiting fabrics; some hand stitching is visible along a few of the joins. The quilt has three layers. The top layer has a rectangular centre of different grey fabrics, pieced together randomly, and the border is made up of irregular rectangles of navy blue fabrics. The backing is of striped cotton, and the lining is made of corn bags. The three layers are machine-stitched together at the edges, holding the filling in place. There is no quilting. The quilt is in reasonable condition, though through its years of use there are some stains and holes and some areas where the material is thinning." My own grandfather remembers having a Wagga while growing up in country NSW. As the eldest of seven children, his bed was on the “sleep-out" (the verandah), where extra warmth was needed. While Wagga’s were sometimes made by men, my grandfather’s were made by his mother with any fabric she could repurpose. My grandfather's stories of his Wagga were particularly influential upon the making of the Topology of Memory quilt. The family connection to land, making do, and repurposing fabric is referenced within the quilt. Much of the silk is repurposed from a Sydney fashion house and also donated to me by friends. 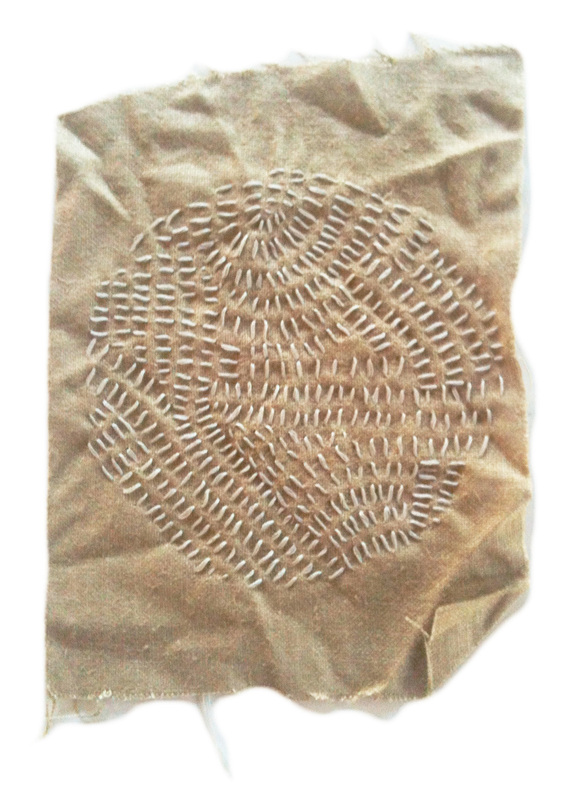 Any leftover scraps are used again in smaller textile pieces, such as the Topology of Memory series. 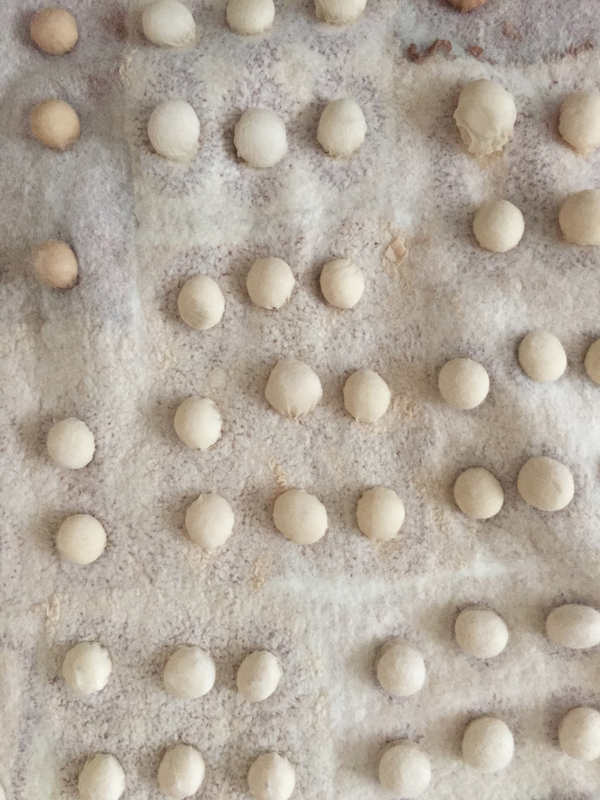 The conscious sourcing and repurposing of fabric is an important part of my practice that not only stems from environmental concern, but also from my family's history of making do with what was available to them. Gero, A., & National Trust of Australia. (2000). Historic Australian quilts. Sydney: The Beagle Press for the National Trust of Australia (N.S.W.). Rolfe, M. (1987). Patchwork quilts in Australia. Richmond, Vic. : Greenhouse. “When hems fell down on school uniforms, my mum’s quick-fix technique was to staple them up. During the school day sitting on a line of metallic shards became increasingly uncomfortable, leaving imprints on the back of hot skin. I remember this being the catalyst for learning how to sew - one of my formative moments in mending and morphing cloth." “My mum popped in on Saturday on her way to lunch in the city. I mentioned the stapling-memory and she laughed, telling me she had never stapled our hems - this was something she did at boarding school. It was one of the stories she used to tell us. Somehow I’ve managed to merge her life-narratives with my own… quite challenging to how much faith I can put in childhood memories, or any memory? I thought I really could remember the staples biting into the backs of my legs..."
The realisation that memory is completely fluid and changing, made me wonder whether it’s all that important that our recollections are totally factual. Perhaps our mind has intentionally changed them for a good reason? It is well known that everyone’s memory of the same event will be slightly different depending on their perspective and past experiences. So does it matter? I think not. Which is convenient because my memory is particularly fluid (read: inexact and full of holes, but quite forgiving). 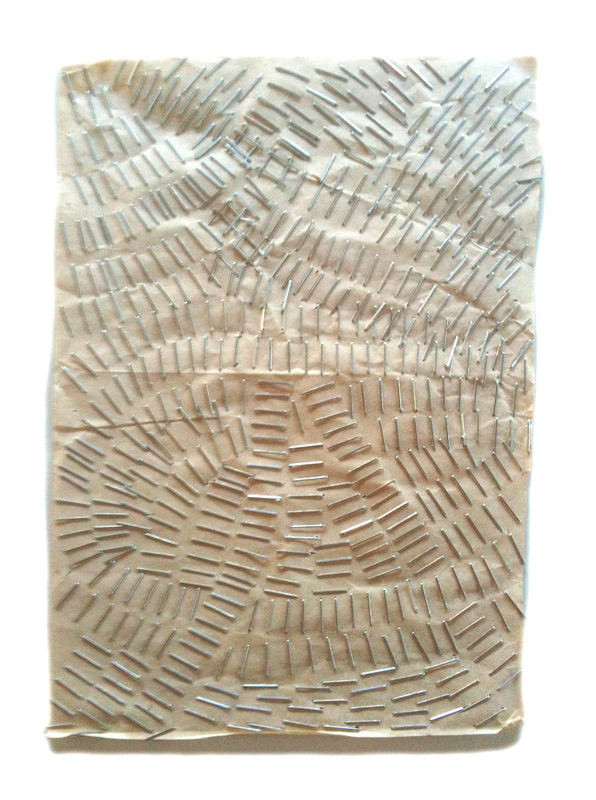 I wanted to acknowledge this observation with the making of a textile series using staples. Mark-making with a stapler is satisfying - the clunk-clunk-clunk of my extra-long stapler as it pierces through paper and fabric. 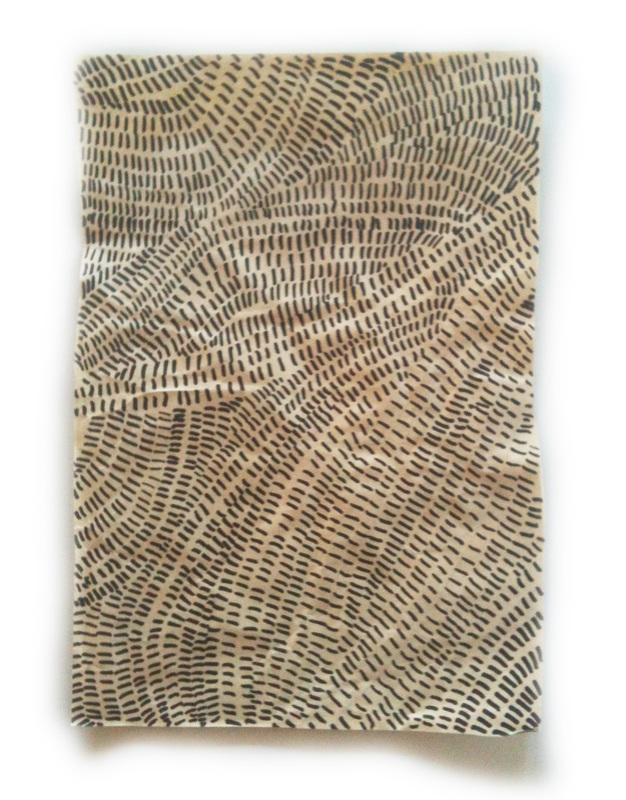 A rhythm forms and one can get lost in pattern-making and repitition. Somewhat like the rhythm found within stitching. I then realised that the staples would be ideal for rust-dying, which I did some experimentation with. I was interested in the results. Ultimately, from these stapling patterns, I made a digital repeat designs that I could then transpose over my ‘map-making’ painting. A merging of significant childhood memories, a celebration of memory’s fluidity. More images of rust dying can be found in my gallery. Also, a collection of inspiring images on my Pinterest page. Thank you for your support! I hope this newsletter inspires you.